Less than a year after Jesse Marsch left his job as the head coach of the New York Red Bulls, he is on the move again in the Red Bull organization. After spending the 2018-19 season as the assistant coach at RB Leipzig, Marsch will become the head coach of Red Bull Salzburg next season. The move is not a surprise. While he was hired as an assistant coach, RB Leipzig had already made a decision on its succession in the head coaching position, naming Hoffenheim head coach Julian Nagelsmann as the coach for the 2019-20 season and sporting director Ralf Rangnick as interim coach for the 2018-19 season while Nagelsmann finished up his contract at Hoffenheim. Marsch's hiring follows the decision of Salzburg head coach Marco Rose to take the head coaching job at Borussia Moenchengladbach for the 2019–20 season. Red Bull Salzburg is considered a big-time European club, despite the Austrian Bundesliga's modest standing. Its record for producing top talent is one of the best in Europe, and the Bed Bull organization in general is considered one of the most aggressive recruiter of young French and African talent. In recent years, it has sold Sadio Mane (Southampton, then Liverpool), Naby Keita (RB Leipzig, then Liverpool), Dayot Upamecano (RB Leipzig) and Amadou Haidara (RB Leipzig). Mane, Keita and Upamecano all transferred from small French clubs, while Haidara was signed from an IMG academy in Mali. Salzburg is on course to win its sixth straight league title and eighth in the last decade. With one loss in 25 games, Salzburg leads the Austrian Bundesliga's championship round by 11 points. 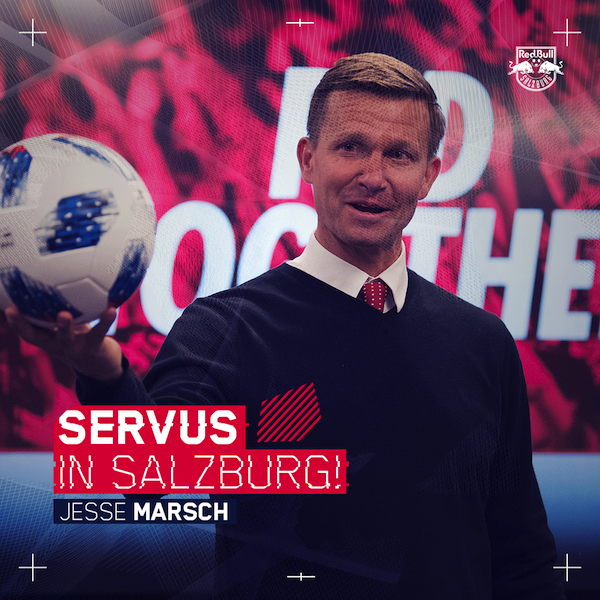 Marsch will become the first American to coach in the group stage of the UEFA Champions League if Salzburg qualifies, but that has been elusive. Its only appearance in the group stage was in 1994-95. Austria is ranked 11th by UEFA, ahead of Switzerland and behind Turkey, in terms of its coefficients used to seed teams for the Champions League. Its league winner will just miss out on an automatic berth into the group stage of the Champions League. Instead, it will enter the playoff round, playing in the Champions Path. If it loses, it will enter the Europa League at the group stage. Salzburg's best finishes in Europe came in 1994 when it lost to Inter Milan in the UEFA Cup final and in 2018 when it fell to Marseille in the Europa League semifinals. In 2018-19, it fell to Crvena Zvezda in the Champions League playoff round and Napoli in the Europa League's round of 16. 1 comment about "Jesse Marsch gets head coaching job at Austrian champion Red Bull Salzburg". Stephan Von lattorff, April 16, 2019 at 4:59 p.m.
RB Salzburg will automatically qualify for the Champions League next fall, as the 11th ranked nation gets that spot into the group stage, unless the winner of this year's CL doesn't qualify for next year via the league, which is highly unlikely. Also, players like Martin Hinteregger (Eintracht Frankfurt), Kevin Kampl (Dortmund, then RB Leipzig) or Croatian starting center back for the national team, Duje Caleta-Car (Olympique Marseille), are noteable products of their academy.